The present findings are drawn from the Jyväskylä Longitudinal Study of Dyslexia (JLD), in which approximately 100 children with familial risk of dyslexia and 100 control children have been followed from birth. In this paper we report data on the reading development of the JLD children and their classmates, a total of 1,750 children from four measurement points during the first two school years. In the total sample, we examined whether heterogeneous developmental paths can be identified based on profiles of word recognition and reading comprehension. Secondly, we studied what kind of early language and literacy skill profiles and reading experiences characterize the children with differing reading development in the follow-up sample. The mixture modeling procedure resulted in five subtypes: (1) poor readers, (2) slow decoders, (3) poor comprehenders, (4) average readers, and (5) good readers. 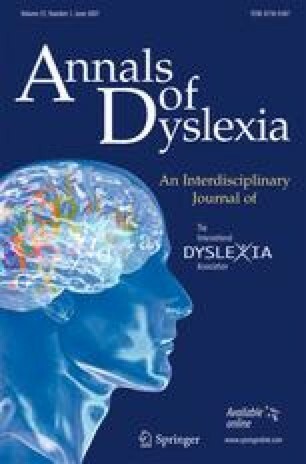 The children with familial risk for dyslexia performed on average at a lower level in all reading tasks than both their classmates and the controls, and they were overrepresented in slow decoders subtype. Differences between the subtypes were found in the early language and literacy skill development, as well as in the reading experiences of the reading subtypes. This manuscript was peer reviewed, processed and accepted under the editorship of the immediate past editor Dr. Che Kan Leong. The JLD belonged to the Finnish Center of Excellence Program (2000–2005) and was supported by the Academy of Finland (#213486), the Niilo Mäki Foundation and the University of Jyväskylä, and the Finnish National Graduate School of Psychology. We would like to thank the families who participated in the study. We also thank Matthew Wuethrich and Jane Erskine for polishing the language. The pairs with same subscript letters do not differ significantly (p > 0.05) based on ANOVA post hoc (Bonferroni corrected) paired comparisons. Values are standardized (to the JLD control group’s distribution) because most of them are composites of several measures. aCoding of RAN: the faster the time, the higher z value.